WebDComp Media provides performance-based marketing and lead-generation services to B2B companies in Houston and all across Texas, to give them a decisive edge over competition thanks to geolocalized websites, organic SEO and multichannel online marketing strategies. Combining only the most innovative and cost-effective technologies with the knowhow of its team of marketing experts, WebDComp Media has become a leading web agency in Houton & Texas area for B2B business services, automated online marketing, multi-sites and local SEO. “Our success is only that of our clients, and is a tribute to our pledge to deliver cost-efficient strategies that pay for themselves and fuel our client’s growth”, says Matt Bucknell, founder of WebDComp Media. “By customizing and constantly adjusting on demand services to each client’s needs, we make sure to provide winning strategies for every budget and specific goals in any given market”, added Mr Bucknell. 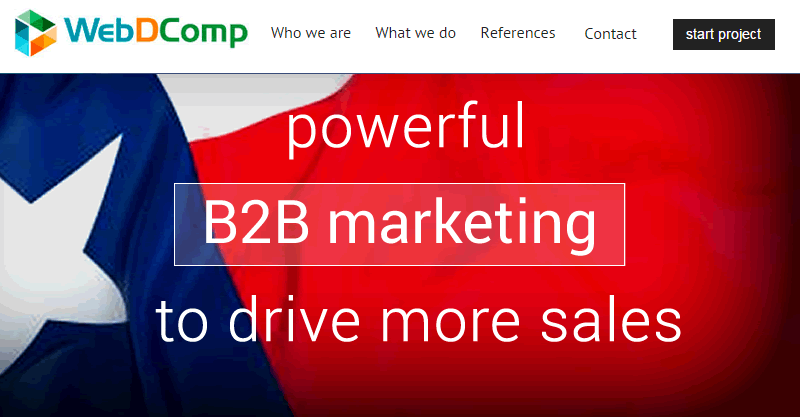 B2B companies in Texas may just have found in WebDComp Media a new champion standing out from the web agencies crowd. Contrary to most marketing solutions who merely recommend best practices, WebDComp Media delivers predictable results for local and mobile SEO, ecommerce, web marketing, social networking and community management. For B2B businesses focused on making their online marketing budgets work harder, WebDComp Media integrates all those affordable and high-performing strategies to provide the kind of return on investments most others can’t. For more information about WebDComp Media, please visit www.webdcomp.com. For more information about WebDComp Media, please visit www.webdcomp.com, call (+1)(647)-825-7423 or send an email to sales@webdcomp.com.